My aim is not satisfying myself with knowledge but having a knowledge that is going to be beneficial for others. Adjumani – “One day, I would like to see my name associated with a positive impact for the whole community. I would like to create a legacy that will benefit the community, the country, and ultimately the world – if possible,” says Vumilia Ameshinda reflecting on his future. Vumilia is one of the refugee students sponsored by the Jesuit Refugee Service (JRS) attending Ocer Campion Jesuit College, a Jesuit secondary school in Gulu, northern Uganda. He is originally from North Kivu, Democratic Republic of Congo, a land long tormented by violence and instability. Over one million people are displaced and more than 280,000 have found refuge in Uganda alone. Vumilia was on holiday with his grandparents and his two brothers when violence reached them, and they were forced to seek safety. “There was an attack and we had to run,” he recalls. He has been in Uganda for 7 years now and has never seen nor heard from his parents again. During his first year in Uganda, he spent entire days at home with very little to do because his family could not afford to send him to school. This is a known reality faced by the majority of displaced and refugee children due to their displacement. Although Uganda has an open-door policy in regard to refugees, providing them documentation as well as the right to work, grow crops and move freely throughout the country, the increasing number of refugees has put significant strain on the education response. Overcrowded schools, limited qualified teachers, and lack of resources make access to education a challenge for the local community already, not to mention for refugees. In 2017, less than 12 per cent of secondary-education-age children had access to secondary education in northern Uganda. Thanks to a JRS scholarship, Vumilia is one of them. When he first encountered JRS, he was given the possibility to enrol in primary school despite the language barrier. Coming from a French speaking country and having to attend class in English, Vumilia proved himself able to learn the new language while also brilliantly progressing in school. As a matter of fact, he passed his primary school final exam as the best student in his class, obtaining one of the highest marks in the whole school. 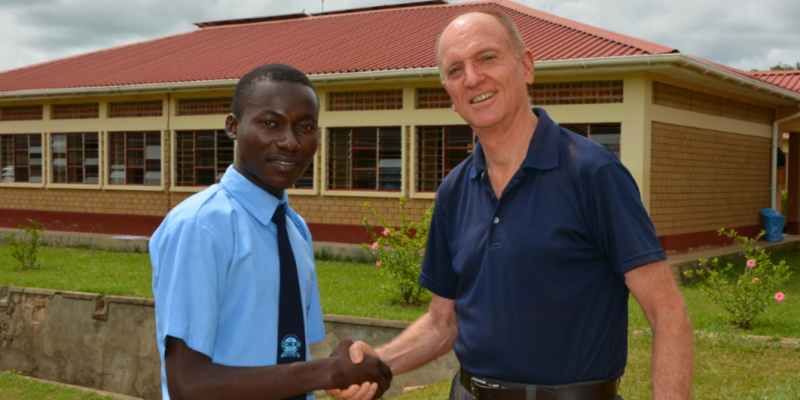 As a result, JRS granted him a scholarship to attend Ocer Campion Jesuit College, where he continued performing well. Vumilia is aware of how fleeting his future is, but he is determined to do everything he can to not miss a single opportunity to pursue his education.